1. The “nostalgia” effect: yes, it may be a hackneyed trick… but let’s be honest: it works! Playing Guybrush again is a superb starting point. And furthermore, meeting Elaine, LeChuck, the Voodoo Lady… makes the player look kinder on any game! 2. The puzzles: logic, understandable… yet fun, unexpected and surprising! We dare saying they’re really close to the puzzles of the first and the second part of the saga. 3. The plot: due to its episodic nature it’s difficult to review the whole story, but the approach to the story in this first episode, as well as the plots that remain open when it’s finished, are REALLY fun. As usual, there are great secondary characters and some dialogues are hilarious. 4. 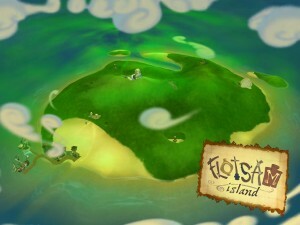 The map: it’s both an influence of the first parts of the saga, and a way to “widen” the game. There is no doubt that if every location were placed together, the players would feel that the world they can explore is narrower. 5. The menus: we know it’s something most people don’t pay attention to… but the way the game is linked to the menus and the menus are linked one another is awesome, and gives a cool sensation of “organic” continuity, as if one was never actually leaving the game. 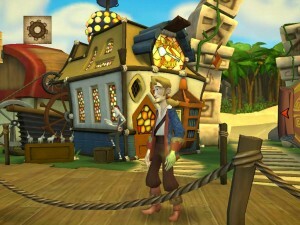 TellTale‘s “Tales of Monkey Island – 1” for iOS is one of the funniest adventures we have played lately. Despite the awful control system (honestly, one can never get used to it), some “inverse” puzzles and a clearly improvable inventory system… we had a great time playing it!!!! 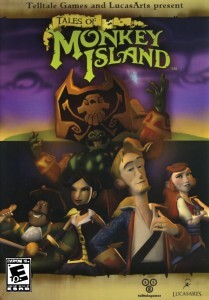 If you want to rekindle the feeling you had when playing the first two games by Lucasarts… give this one a chance!